Putin rebuffed by China's First Lady Jump to media player Russian President drapes his shawl across China's First Lady Peng Liyuan, but she declines his help and removes it. Russia looks to boost China ties Jump to media player The continuing crisis between Russia and Ukraine means Moscow is increasingly looking at boosting its ties with China. Beijing cuts smog for APEC summit Jump to media player Beijing is gearing up for a major international summit and the scale and cost of its preparations would put any other host city to shame. Russia's Putin announces divorce Jump to media player Russian President Vladimir Putin and his wife Lyudmila have said their marriage is over. 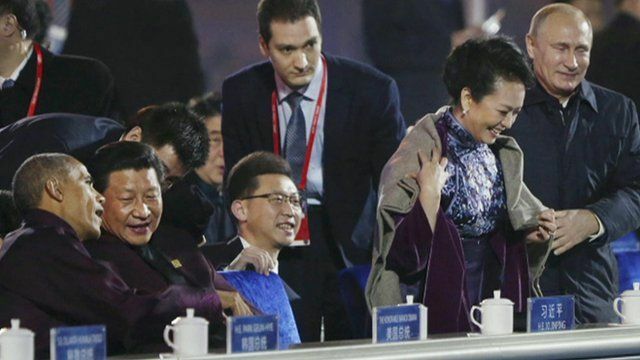 Russian President draped his shawl across China's First Lady Peng Liyuan, but she declined his help and removed it. They were sitting next to one another at the Asia-Pacific Economic Co-operation (Apec) summit near Beijing. Mr Putin was trying to prevent the wife of Chinese Premier Xi Jinping from getting cold during a firework display at the Bird's Nest stadium. The gesture seemed initially well-received but Peng Liyuan swiftly thought better of accepting the shawl and took it off before having it taken away.